Mosul, 2017. 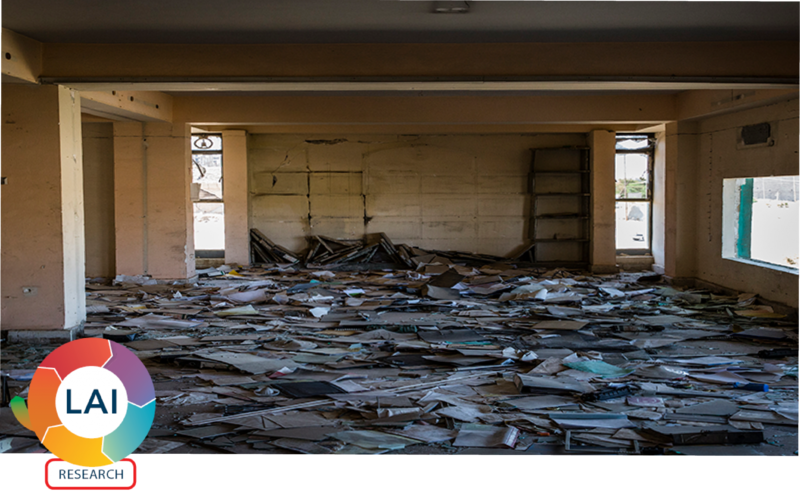 Paperwork littered the remains of ISIS" bombed-out Ministry of Agriculture. (Ivor Prickett/The New York Times/Redux). In 2014–2015, the world watched in horror as the Islamic State (ISIS) managed to gain control of an area the size of Great Britain in Iraq, Syria, Libya, Nigeria, and even the Philippines. Driven by an ultra-fundamentalist and millenarian ideology, ISIS subjugated, terrorized, and mercilessly killed its opponents. Its brutality is widely known, but much less recognized is its other tool—bureaucracy. As a part of its “caliphate,” ISIS issued birth certificates and had a tax collection system, even a DMV. “The Islamic State’s capacity to govern is really as dangerous as their combatants,” says Fawaz A. Gerges, author of ISIS: A History. This bureaucracy, like any other, left behind a huge paper trail. In September 2018, GW announced a partnership with The New York Times to digitize and make available some 15,000 pages of documents called the ISIS Files. These documents include land deeds, tax returns, military strategies, internal regulations, police files, grammar books, photos, and a myriad of other primary sources that reveal the inner workings of one of history’s deadliest and best-organized terrorist organizations. Over the next two years, GW Libraries and Academic Innovation (GWLAI) will work with GW’s Program on Extremism to translate the documents into English, analyze them, and make them available in Arabic and English in an open, searchable website. This public repository will allow researchers around the world, including those in Syria and Iraq, to access a wide array of documents that provide invaluable evidence on the activities and atrocities carried out by ISIS. These documents record the history of the personal lives of very real people—people who have lived through unimaginable upheaval and whose safety is paramount. The documents will be fully translated and reviewed before they are made available online to help ensure that information that could harm civilians will not be published. In addition, accompanying expert analysis on relevant themes will be posted online so that the context is better understood. GWLAI is deeply committed to the preservation of the human record, and the promotion of its access. This public repository will serve as an account of genocide to aid in a better understanding of one of most dangerous terrorist organizations in decades, providing a sense of how such an entity runs a state and informing future policies to prevent the rise of the next ISIS-type of group. For more information on how to support this important initiative, please contact Tracy Sullivan, executive director of development, GWLAI, at 202-994-8928 or [email protected].